Winchester Country Club an exclusive semi-private golf and residential community, located in the foothills of the Sierra Mountains was trying to inform residents in the higher elevations about their Winter Membership. Using a Cross Media Marketing Campaign with an offer of free lunch and a free round of Golf were able to get many respondents to visit their personalized URL and sign up for other valuable offers. 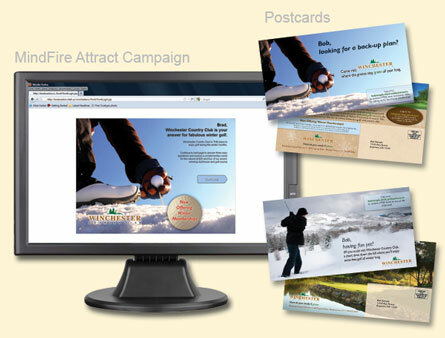 Their Cross Media Marketing Campaign featured two separate postcard mailings and a personalized landing page for each person. This allowed them to acquire a 2.8% response rate of the mailing list to visit their page and 88.9% of those who visited filled out the questionnaire and establish themselves in Winchester’s Database.